A healthy, functioning immune system is critical if beef and dairy cows are to lead a long and productive life. Chloe Palmer finds out more. Correct management of animals to support their immune response is key and starts as soon as a calf is born. Russell Fuller of Tyndale Vets in Gloucester, describes an animal as having ‘innate’ and ‘acquired’ immunity, and both play a vital part in protecting the animal from disease. The innate immune system includes the skin and saliva, and as long as they are not damaged or impaired, they will continue to work effectively to prevent disease. Mr Fuller says: “Part of an animal’s acquired immunity is the antibodies which the body produces to fight off an infection or disease. The first time an animal is exposed to a particular type of disease or infection, it is slow to mount an immune response, usually one to two weeks. An animal will obtain some passive immunity from its dam, but Mr Fuller points to the importance of colostrum in developing a calf’s immune response. He says: “The first critical stage for ruminants is to make sure they have enough colostrum within the first six hours of their life. This is because their ability to absorb colostrum reduces rapidly during these first few hours. Mr Fuller says making sure a calf receives the right amount of nutrition in this stage of its life is critical. Stress caused by a lack of food or a low environmental temperature will impede the development of the immune system. The cow’s immune system is under the most pressure during the post-calving period. Mr Fuller says: “We know dairy cows suffer a dip in their immunity at calving and we think this occurs so she does not mount a strong immune response to her unborn calf. We suspect this is also the case for beef cows, but there is no direct evidence yet to support this. “This situation is further exacerbated by the stress the cow experiences around calving, especially as she begins lactating. The dam has to switch from a relatively ‘laid back’ state where her body only has to grow the calf. “At rest, a cow uses around 60 to 65 megajoules (MJ) of energy, plus a further 45MJ to grow a calf at full term. 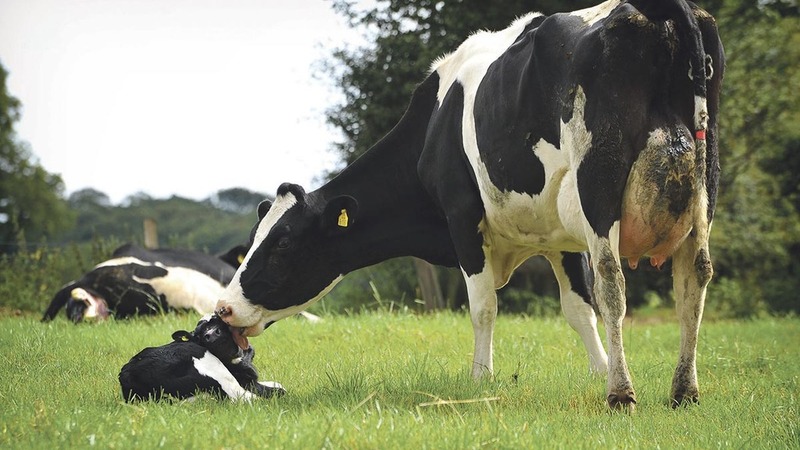 Mr Fuller advises monitoring body condition scores carefully as if cows are calving at an optimum body condition score of between 2.75 and 3.0 it will help limit weight loss, mitigating adverse effects on the immune system. RESEARCHERS are still establishing the degree to which immunity is genetically determined, but Mr Fuller says the genetic markers indicating a greater level of resistance to disease are now known. This has enabled genetics companies to select bulls which are in the top ten per cent of immune responders. “This year, bulls are now available which carry the genetics, meaning they are likely to be more resistant to clinical mastitis. What we are now missing is the field data to show these genetics translate into improved immunity within progeny in a commercial situation. “This must come from farmers, so we are encouraging feedback so we know how these animals are performing within the herd and the actual mastitis levels observed,” Mr Fuller explains. While he refrained from highlighting individual breeds which display higher immunity, Mr Fuller instead pointed to management as the key factor dictating whether an animal’s immune system is effective. He says: “High yielding dairy cows are more at risk of disease as they are working hard and the immune system is under more pressure. (PI) individual is present within the herd. “A calf will be infected in the first 110 days of pregnancy, before its immune system is fully developed. The calf thinks the BVD virus is part of its own being so does not mount an attack,” says Mr Fuller. “Once the calf is born, it will shed vast quantities of the BVD virus in faeces and mucus. BVD, as with other infectious diseases can be managed to some extent with the use of vaccines. Mr Fuller warns of vaccinating when an animal is under stress, for example after a long journey or if it is ill, as the vaccine is unlikely to work. they act as anti-oxidants. Research has shown selenium deficiency will compromise the ability of the immune system to function.